A complete self-study toolkit for PMP® and CAPM® exam prep based on PMBOK® Guide, 6th Ed, bundled with a unique ITTO Tool, a fully featured Exam Simulator containing 1000+ sample questions, 2000 Flashcards that double up as study notes, multi-dimensional Quizzes, performance reports, Project Management formula guide and a course completion certificate for Contact Hours. Transforms the boring 800-page PMBOK® Guide to an interactive and engaging learning experience. It's unique, innovative and exceptionally powerful. Save weeks of prep time with this one tool. BrainBOK PMP® and CAPM® exams are realistic, unique and challenging. Developed and reviewed by PMP®-certified professionals, our exams are ideal for assessing your exam readiness. Our flashcards cover nearly every term that you can expect to see on the exam. These are the finest and the most comprehensive set of flashcards on the market and also double-up as study notes. Combine the power of the ITTO Explorer with multi-dimensional ITTO and Glossary quizzes, and you have the best tools in your arsenal to conquer the PMBOK® Guide and pass the exam. 8 hours spent with BrainBOK are equivalent to 40 hours with the PMBOK® Guide. 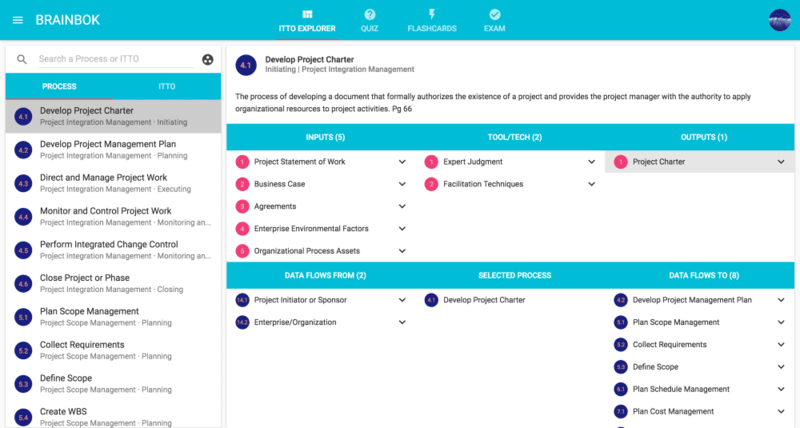 Our ITTO Explorer tool is the fastest way to wrap your head around the 800-page PMBOK® Guide. BrainBOK helps you cut your exam preparation time from 3 months down to just 1 month. We offer the best DIY-toolkit (contact hours, exams, flashcards, quizzes, ITTO, formulas) to ace PMP® and CAPM®. Our hand-crafted tools and meticulously curated content have helped thousands of project managers focus on the essentials without getting overwhelmed. A few bucks spent on BrainBOK can potentially save thousands on training and re-examination costs, not to mention the opportunity cost associated with not getting certified sooner. As a bonus, you can claim up to 36 contact hours simply by using our tools! BrainBOK provides a unique experience that makes the learning process interesting and fun. Developed with cutting edge technologies, our application is optimized to provide a smooth and seamless interface across all devices (computers, mobiles, tablets). Our content is developed and thoroughly reviewed by PMP®-certified professionals, and is constantly updated based on customer feedback. Our Reviews page stands testimonial to the quality and customer satisfaction with our product. Pass in the first attempt with our program, instead of multiple attempts with traditional classroom and online programs. Our unique program fills the knowledge gaps that others leave open. It can be used standalone or to complement other programs. Developed under license from the Project Management Institute (PMI®) in compliance with their guidelines. Save hundreds of dollars in expensive exam prep courses, and claim your 35 contact hours by simply using our self-study program. Our content is 100% aligned with PMBOK® Guide, 6th Ed and updated for PMP® exam changes in 2018. BrainBOK has been trusted by more than 50,000 project managers around the world since 2010. BrainBOK is licensed by top universities and project management training providers in the US, ME and Asia. Get free and unlimited access with the basic account. Simply sign in with your email or social account and start preparing now. Try all the features of our product with the free Basic Account.